Our in-store computer repair service is equipped to handle all varieties of hardware and software issues for desktops, laptops, and servers of any brand including Apple. Our highly trained technicians will perform thorough troubleshooting to diagnose the root of the problem and get your computer back up and running as soon as possible. We stock common hardware components such as hard drives and power supplies to help expedite the repair process. If the repair isn't worth the financial investment, we'll let you know before performing the work and recommend a suitable new or refurbished replacement computer. All In-store Computer Repair services are a flat-rate of $60.00 including tax. Hardware costs not included. Drop your computer off anytime. We're open from 9am to 5pm Monday - Friday and 9am to 7pm on Wednesdays. No appointment necessary! 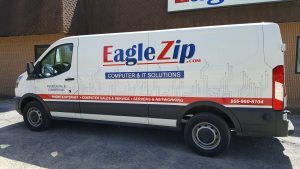 We also offer on-site computer repair and pickup/delivery service for both home and business customers who would prefer to have the work done at their location or are unable to disconnect their computer and bring it to us. Some issues may not be able to be resolved on-site such as lengthy spyware & virus removals or a laptop screen replacement, but we are happy to bring these repairs back to our repair shop to receive the attention they deserve. Other issues such as networking or printer connectivity issues are actually easier to resolve on-site where we can troubleshoot the issue hands-on. On-site Service is $75.00/hr. + tax. Pickup/Delivery is FREE in Jamestown, Town of Ellicott, and Youngsville, PA.
Pickup/Delivery in other areas is $10 per trip. Travel charge of $1.10/mile applies to locations greater than 25 miles from our Jamestown office.